Looking for a chicken wing that is crispy, baked, but has a fresh taste? These green herb chicken wings are tender because they are marinated in vinegar and then tossed in a sauce of fresh parsley and cilantro! It’s the weekend, the hubby is home after being gone all week, our Kentucky Wildcats beat Georgia this week and it’s time to get our grub on! 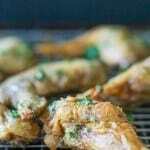 March Madness is quickly approaching and we are in need of some finger foods to watch the upcoming games, so I am whipping up some green herb chicken wings. We need finger foods that are not labor intensive and light enough that when Brooks starts yelling and throwing things (food included) he doesn’t break anything. The pressure is on our Cats as they are having a great season, going into this month, which increases our referee yelling time exponentially! Chicken wings are a great food to serve at a sports gathering because they are universally liked, except by vegetarians and people who have an aversion to meat with bones attached. Yes, those people exist, I know two personally. It’s about time we use some herbs on our wings and bring them to the forefront. 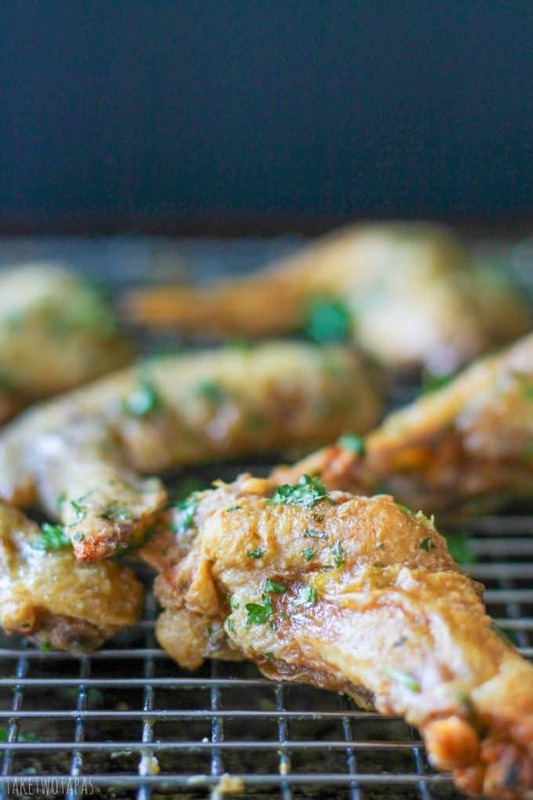 These Crispy Green Herb Chicken Wings do just that! Wings also fit into the Paleo lifestyle that so many are adopting, we included! 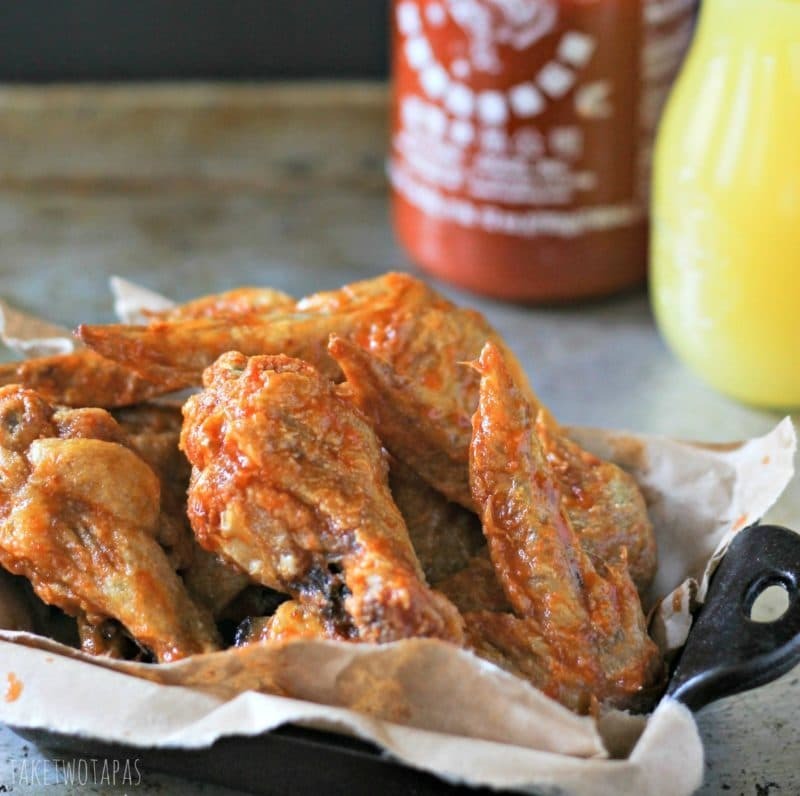 Hopefully, you have tried my Sriracha Pineapple Wings already, but if not, hop on over to that recipe and you can make both at the same time! Those have a little more kick than these, but you can always increase the amount of crushed red pepper if you want more spice. The process for making my green herb chicken wings is simple. Mix your marinade and get those wings tossed in so the flavors can soak in. That bit of red wine vinegar helps to tenderize the meat and add some depth to the flavor profile. We let our wings marinade for a few hours but this was out of necessity. I prepped food early since I had some other things to do that day but you can marinate them for as little as 30 minutes if you are pressed for time. We baked our wings on a wire rack that was placed on a baking sheet, as this helps to keep the wings crispy as they are not sitting in their own juices while cooking. I bake our green herb chicken wings for an hour because we like our wings well done, almost to the point of chicken jerky, but you can cook yours for as long as you like, as long as they are cooked all the way through. No raw or under-cooked chicken allowed! While the wings are cooking mix up your coating. 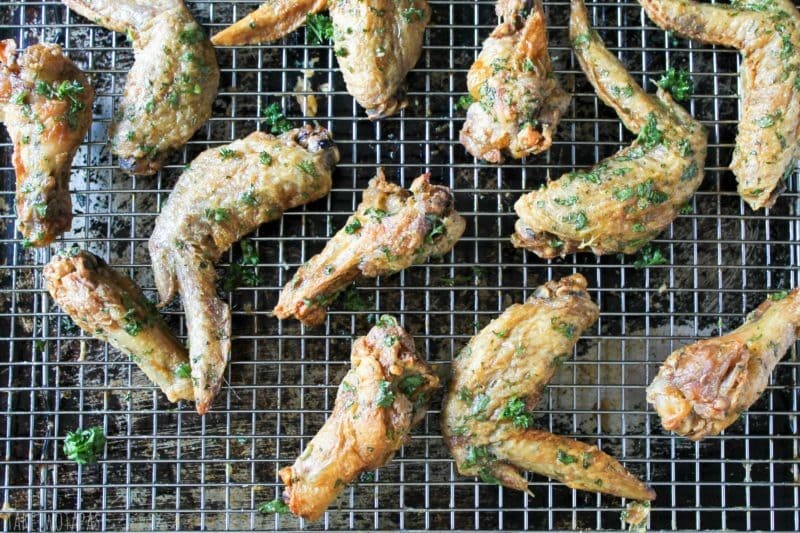 When the green herb chicken wings are done, toss them in the coating and chow down. These are also great reheated the next day but ours never make it that far! Enjoy your wings and GO CATS! Who is your favorite basketball team and who do you think will win the Final Four? Don’t you just love the green color contrast on these crispy green herb chicken wings? Looking for a chicken wing that is crispy, baked, but has a fresh taste? 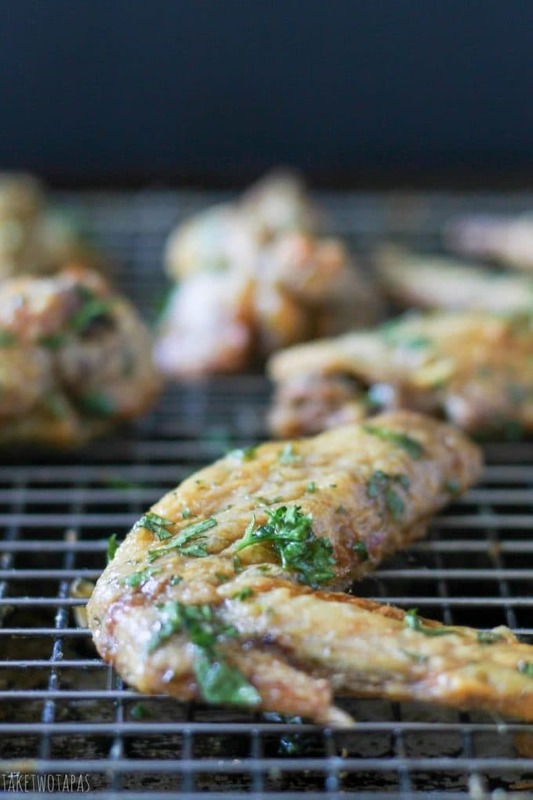 These green herb chicken wings are tossed in a sauce of fresh parsley and cilantro! Trim your chicken wings to your liking. I used the whole wings but separated the drumsticks and the flats. Mix the marinade and add the wings. Cook wings until done. I cooked mine for an hour but you might not like yours as done as mine. When done, turn the broiler on high and broil wings for 5 minutes on each side to crisp them up. I like my wings REALLY well done, almost like chicken jerky, so I cook mine for a long time. While the wings are cooking, mix the coating. When wings are done, remove from oven and toss in your coating. Yum J. We love wings here so will def be trying these. You’ll love the fresh herb taste! These look fabulous! My hubby loves chicken wings! I’m ready to get grilling! Thanks for sharing at the Inspiration Spotlight party. Pinned & shared. See you again soon! These look amaaazing! 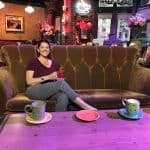 Love your professional quality photos too-wow! I pinned this wing recipe and can’t wait to try it! Thanks! Thanks so much! Chicken wings are my favroite! We certainly ate our fill during the tourney even though Kentucky went out early! Love these! Garlic, cilantro AND parsley? Sign me up! These sound so good! I love March Madness, and these would be fab for any gathering. Not sure who I’m pulling for, though! Because they are green they are perfect for St. Patrick’s Day! These look like awesome game day food. I really like the marinade you have here. Goodness those look amazing! So often wings are super sticky or spicy, but these flavours sound simple and delicious!! Wings is my fav part…you can finish whole other chicken part but left me some wings! ^,^ And your green herb on those wings looks superb. Me too! I love to crunch the skin at the tips! What a great, simple way to make wings. I’ve used a parsley/cilantro mixture in an oil and lemon juice base for grilled chicken kebabs, but never thought to use a similar mixture for wings. Superb! Thanks so much! I love that the fresh herbs negate the richness of the chicken wings. These are beautiful! I make chicken wings with cilantro as well but I love how crispy these are! Perfect for game day! Thanks so much! I am not one for soggy skin! Once you have one you won’t be able to stop! You can put just about anything on a chicken wing! I love a good chicken wings recipe, adding fresh parsley is a great idea! These look so good and easy, and LOVE the cilantro addition in the herbs!!! I am such a Chicken wing nut!! I love Chicken wings 🙂 Love the flavours and spices, herbs you’ve added in this! Completely mouth watering 🙂 Pinning! I’ve been lusting after chicken wings for literally months, so I’m pinning this for my “don’t forget to make this” list. Love the peppery marinade and the addition of red wine vinegar as opposed to other types more common in wings recipes. Thanks Laura:) I used the red wine vinegar because I ran out of my balsamic. It turned out so I went with it! I love wings, and the idea of green herbs sounds delicious!